Hello, thanks for the chance to speak with you. I am a professional journalist, working as sports editor at “Bulgaria Today” daily newspaper. My first article was written in 2000. Since then the duties send me around the world to cover some of the most interesting sports events. I’ve got a chance to be at the last two Summer Olympics and to feel something very special there. My first book “The white prisoner: Galabin Boevski’s secret story” was published in Bulgaria in December 2013. The English edition was released on Amazon as e-book and on CreateSpace as print on 30 May 2014. “The white prisoner: Galabin Boevski’s secret story” is a real life non fiction novel. The events in the book happened during the amazing life of the main character, who was Olympic, World and European weightlifting champion. He was considered as one of the best in the history of the sport, but in 2011 was sentenced for nice years in Brazil prison for cocaine traffic. All of a sudden, one day in October 2013, Galabin Boevski landed in Sofia airport. Nobody knows how he was able to get out of the prison just two years after he was put in. I love to write at the evening after the end of my work. When the silence started to rule around me I’ve got a chance to enter into my book’s world. 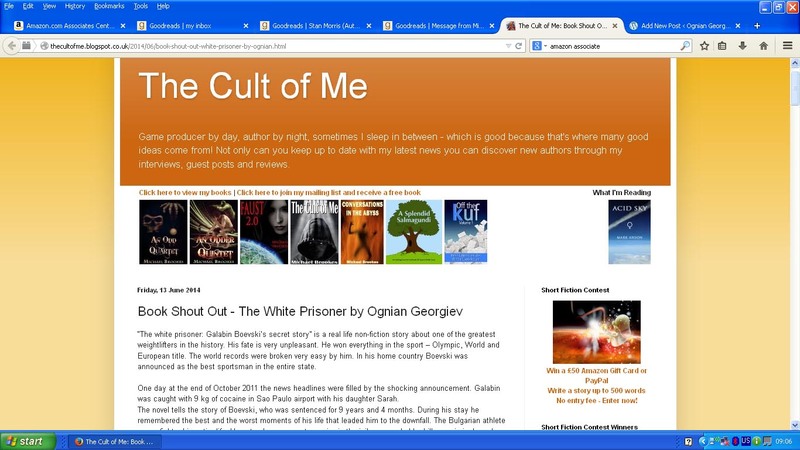 As my novel is non fiction the research was connected with a lot of interviews. So first i need to script down the interviews and then to organize how the book will look. I may write for hours, but when my eyes start to hurt I stop. Karl May and Emilio Salgari were my favorites when I was a kid. Then I found the world of fantasy authors like Raymond Feist, George Martin, Guy Gavriel Kay. From the crime genre Michael Connelly is the person who makes me feel great pleasure when reading. I am big fan of history books, because of my University specialty – Archaeology. I am trying to do the best possible marketing for my book. For now it gives nice results, but I am learning a lot every day. For every indie author it’s very important to find the right way to introduce his book the the readers and always to respect them. I am spending a lot of my time updating the facebook page of the book (https://www.facebook.com/galabin.boevsky) with some nice stories and pictures. Recently I find as well twitter to be very nice way to show the audience your book. Goodreads is great place for finding some new friends and to receive any kind of help or advice as author or reader! I am new author as well, so my impressions are quite fresh. The most important thing is to follow their own style and not to become slaves of well written guide “How to become best-selling author”. Yeah, you may receive some hints, considering the writing, editing and marketing, but it’s up to you to do the best possible to prepare the next big hit in literature. To consider myself publishing my book on English. The language is not my strong part. This was the reason that I used professional translator, English editor and a strong army of test readers. Sergey Lukyanenko’s Night watch series. He is very good writer. I love the way he developed his ideas. I started to make the research and pre-marketing of my next book. It will be a real life story for two of the most successful sportsmen in the world. Their careers changed in very interesting way after they clashed in Atlanta Olympics. For sure it will be books that I never read and they will be big ones. Probably the only one that I would take from those that were read will be Theodor Momsen’s Roman history. This is a peace of brilliance. It’s so reach, that you may build your very own world in such a desert island. Mika Waltari and his Sinuhe The Egyptian will also be in my list. Probably the other two will be the last John Grisham novel and the latest sports biography that is on the market. Randall J. Strossen, Ph.D. , Founder & President, IronMind Enterprises, Inc. The photo was shared by Mr. Strossen on the official twitter of “The white prisoner: Galabin Boevski’s secret story”. 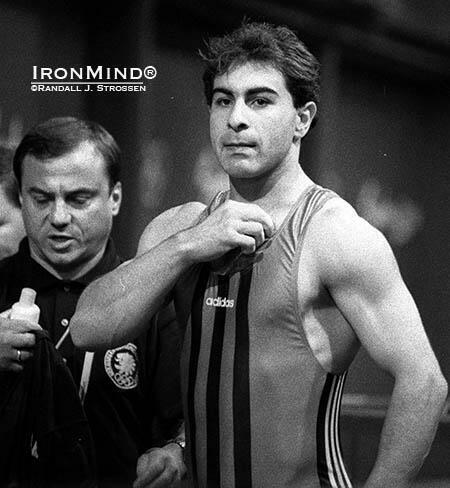 It’s unique moment – Boevski and the president of Bulgarian weightlifting fededration Anton Kodjabashev just before some of his attempts in Sydney. At the 2000 Sydney Olympics, three Bulgarian weightlifters failed doping tests. The rules said the entire Bulgarian team was thereupon supposed to be expelled. However, Galabin Boevski had already competed and, because he did not test positive, he was allowed to keep his gold medal. In 2004, Boevski was found liable of tampering with the urine sample he provided at the 2003 world championship in Vancouver. He would be banned from competition for eight years.